So here we are: on the other side. And to be clear, 2011 will not be your year of cutting back. It will be your year of more. More Spicy Cucumber Margaritas. More Shrimp and Bacon Tacos. More hidden basement speakeasies with wicker chairs hanging from the ceiling. 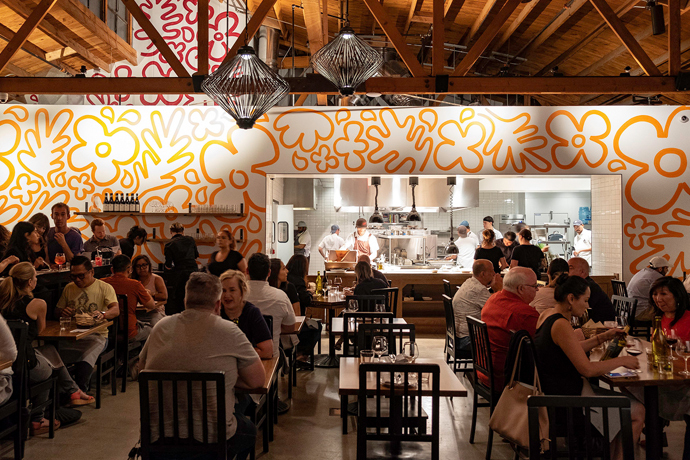 In other words, it will entail something called Mas Malo, the sprawling new Downtown sequel to Silver Lake’s hipster Mexican institution, opening this Friday. Like the original Malo, this one’s black, white and red all over―but everything’s just... mas. The room is bigger. The ceilings are higher. The location is historic-er. So you’ll probably feel the urge to order more tequila, just to be proportional. Oh, and after dinner, you’ll head down a covert stairwell and through an unmarked door to find Mas Malo Cantina: a breezy basement speakeasy that feels like a Brazilian back porch. This is where you’ll keep your night buzzing with a couple of Señoritas (tequila, hibiscus, simple syrup) while kicking back in a wicker chair dangling from the ceiling. Chairs on the floor were so 2010.